This book was both better and worse than I expected. And, at the same time, it was exactly what I expected. Nate “Ghost” Wheeler is ex-military and works for Black Knights, Inc., a government sanctioned independent contractor operation that “handle the jobs the government doesn’t want its name attached to” (or some nonsense like that). Nate is recently back from a mission that went horribly wrong and his best friend, Grigg, ended up dead. Nate has always had feelings for his best friend’s little sister, Ali Morgan, but has stayed away because Grigg warned him away. Ali finds herself being followed and then someone tries to mug her, so she runs to Nate for help. 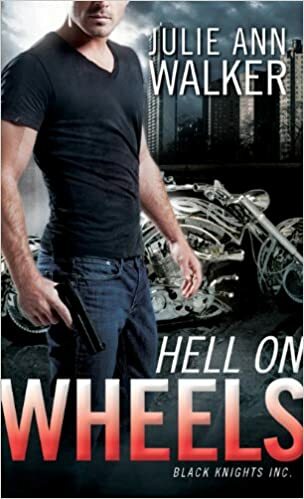 They race around the country on his motorcycle trying to outrun bad guys and figure out what Grigg was up to before his death. There is both so much going on in this book and so little. I do not normally read romantic suspense (which I think(?) this falls under), so this may all be normal. It was like reading one of the myriad crappy action films that my husband watches and that I watch out of the corner of my eye while reading. And on that level it totally worked. It was a very fast 350 pages. the author’s aversion to the letter ‘g’ at the end of a word as well as her use of Y’ instead of ‘you’ (eg. “What are y’ doin’ here?”) The hero speaks this way FOR. THE. WHOLE. BOOK. Explanations for feelings – there is a conversation between Nate and Ali where they talk about how little she knows him and not two pages later is when she has the revelation that she loves him. As I said before, I do not normally read romantic suspense. It’s a little too action-y for me. What I want out of a romance is the relationship, and when there is SO much action happening on every page there is not really space to develop the relationship. And, I actually thought these two had a good basis for one, and I liked them as individual characters – but the relationship between them just wasn’t fleshed out on the page. This one was on the NPR best romances list from last summer and was free (still is), so I figured I might as well give it a try. I knew approximately what I was getting in to, and I’m glad I tried it, but I won’t be revisiting this type of book again soon. Share the post "Where’s MY nickname?" It isn’t. It is merely a boring nom de guerre. 🙁 I think a nickname must be bestowed upon you by someone else. But, Malin has come to my aid and I am going to OWN that nickname! I decree that your nickname shall henceforth be “Shiv”? That’s a nice biker gang sort of a name, isn’t it? Don’t complain if you don’t like it, no one said you had to like your nickname, Shiv.